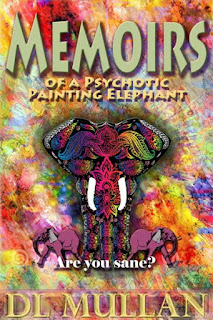 The last cover for Memoirs of a Psychotic Painting Elephant did not give the impression of anything psychedelic or elephanty. To celebrate the beginning of this year's Winter Frost Seasonal Reads Program, Undawnted updated the long form poem's image. I kept the theme going with different colored page headings... in neon inspired tones. If you are going to be creative and have fun, you might as well go for it! I hope you have fun with this poem as much as I did writing it.